Salade Niçoise is gorgeous and delicious. 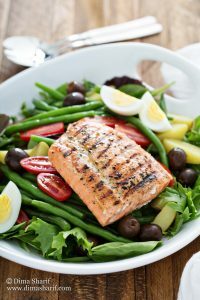 The smooth creaminess from the boiled eggs against the melt in your mouth tuna/salmon (if using seared fresh tuna or cooked fresh salmon) and the crunch from the vegetables makes this salad a blend of textures that will satisfy a picky palate. 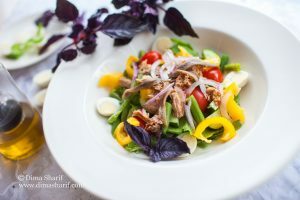 Although simple to make, the freshness and assortment of flavours in this salad makes it delicious and on the verge of addictive. Good and filling enough to have as main course, this is one light lunch you will be delighted to have, especially on those hot summer days! You can also use celery sticks, bell pepper or capsicum strips, artichoke hearts, fresh tarragon… But all these are optional. Place vinegar, mustard, seasoning in a small bowl. whisk until combined. While whisking drizzle the olive oil in a thin steady stream and keep whisking until all are well combined. Chill until ready to use. brush the tuna/salmon with olive oil then season with salt and black pepper. Heat your iron skillet, then sear the tuna on all sides. The best experience is to sear the outside while keeping the inside red and not overdone. TIP: In Salads potatoes are best served chilled after boiling/roasting, they lend a better crispier texture and hold their shape better than when used warm. Using warm potatoes will wilt the greens, which spoils the experience. To plate place leaves at the bottom of the serving platter, top with potatoes, onions & green beans. Top with Tuna or Salmon then add the black olives, eggs & anchovies. Sprinkle with shaken dressing. Do you know that searing fresh tuna will only take a few minutes, just as much time needed to open up a can and drain its liquids!!? Hope this recipe inspired you to go for using fresh tuna in your salads more often.